When it was known as Plumm’s, 42 Ferguson Street was a quasi-regular for us – for breakfasts, lunches and even, IIRC, the odd dinner. I think that between Plumm’s and Mezmez, there was another inhabitant of the address but I can’t recall its name. Certainly, there has been a long period on non-use for the address before the recent opening of Mezmez. Maybe that’s not a bad thing, with a view to dispelling “failed restaurant karma”. Not that we’re suspicious or anything! In terms of a fresh start, it’s also a fine thing the Mezmez crew has overhauled the room so that it bears little or no resemblance to what went before. 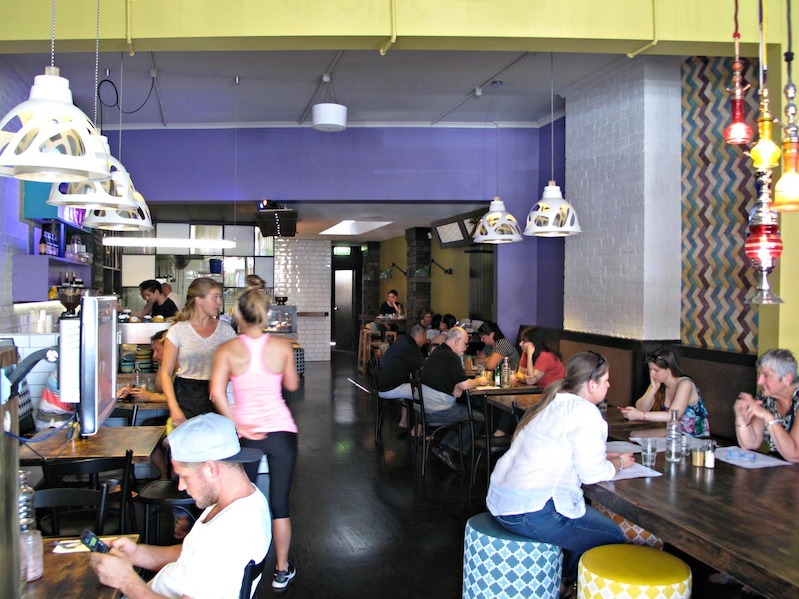 There’s lots of wall tiles, lots of wood and a variety of different seating and eating configurations. When we visit for Saturday lunch, the place is buzzing, there are happy people in abundance and staff are on the ball. Mezmez is a sister restaurant of Pint Of Milk in Newport, so as you’d expect has many of the same cafe strengths going on. But the new place looks and feels very different. 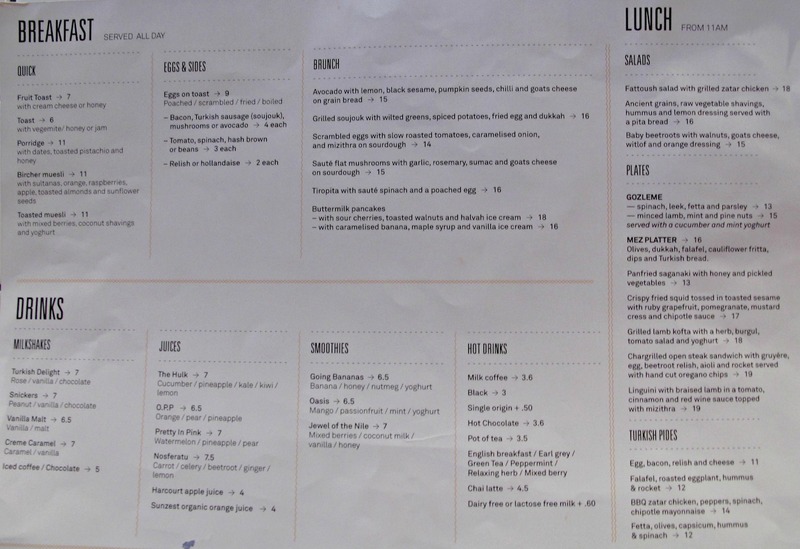 More to the point, outside some orthodox breakfast items, the Mezmez menu (see below) – especially the brunch and lunch lists – evinces a strong Turkish and Mediterranean feel. And that’s mostly why we’re here and excited about it. We’re allocated a small wall-mounted table with tall stools towards the back of the room – and we’re happy about that. 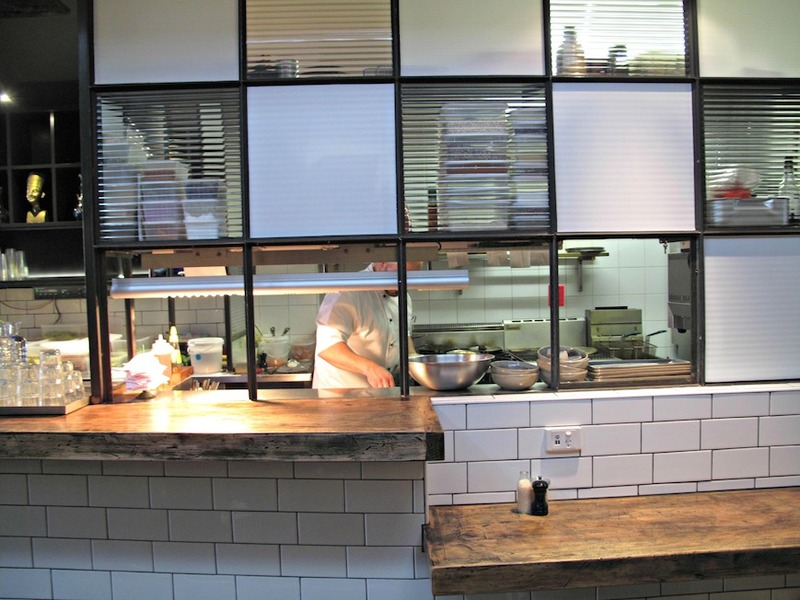 Because we’re sitting right at the very spot where food leaves the kitchen and heads for the customers’ pleasure – so we get a good look, while we’re waiting for our meals, at what other folks have been ordering. 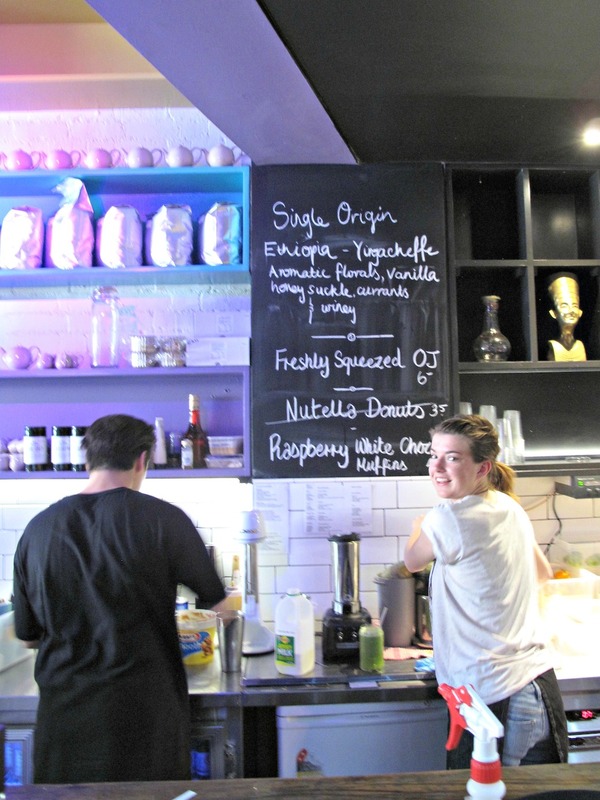 That ranges from breakfasts of the basic, toasted kind and the more ornate and decadent through to an “ancient grains” salad, panfried saganaki, crispy fried squid and preposterously fat lamb koftas. 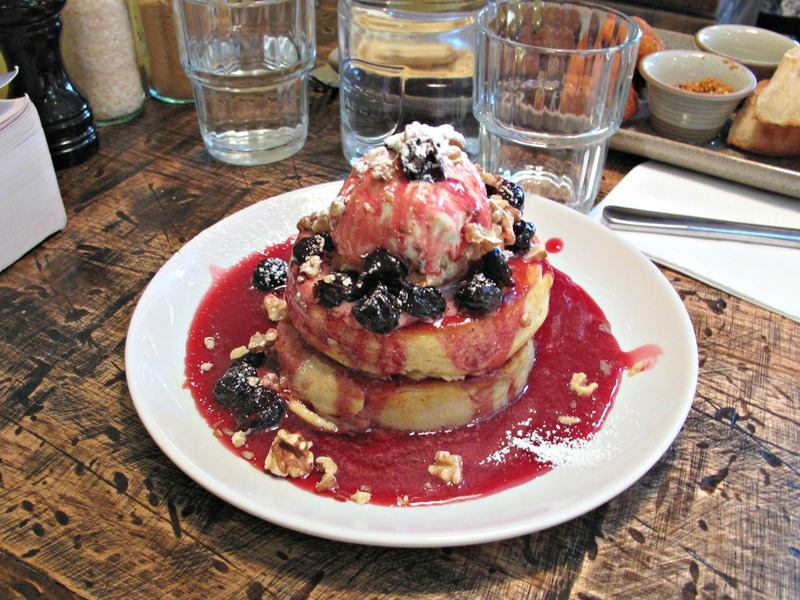 Bennie chooses the buttermilk pancakes with sour cherries, toasted walnuts and halvah ice-cream ($18). He’s happy enough, but reckons there’s too much sauce! I grab a bite and am impressed. Perhaps, at $18, a third pancake might not be too much to expect. And perhaps he’s old enough and savvy enough to understand that just because his father lets him off the leash for a sugar hit doesn’t mean that’s going to be the best direction to head. 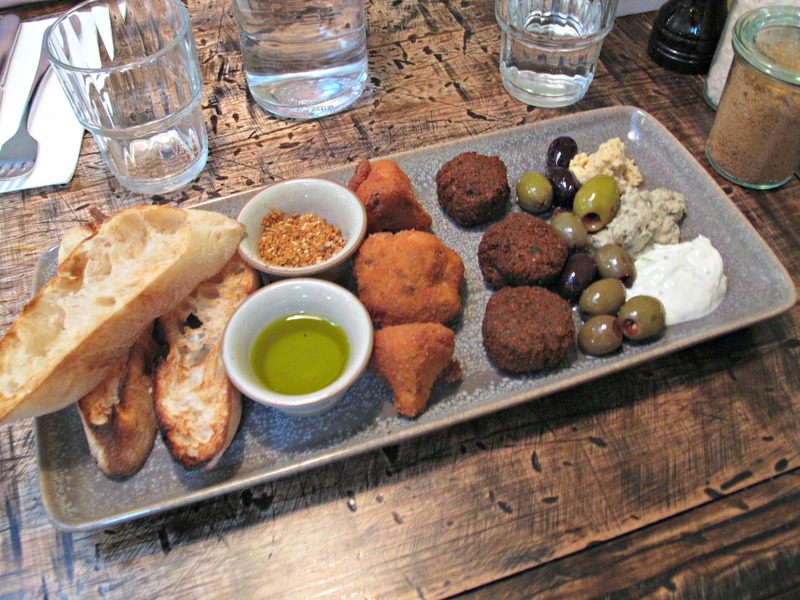 … “mez platter” ($16) with its olives, dukkah, falafels, cauliflower fitters, dips and bread. It’s all good or much better. And I always admire any such dish that is constructed with such skill that all the players are in correct proportion so they all “run out” at the same happy conclusion to the meal. That’s certainly the case here. The outright stars, though, are the tightly-packed and fragrant falafels and sublime cauliflower fritters. Deep-fried yet ungreasy, they’re packed with flavour – and in the case of cauliflower, that always seems to me some kind of miracle. That vegetable doesn’t have the most robust flavour characteristics yet often it seems to survive all sorts of cooking techniques. The only faint quibble I have is wishing the dips had a bit more zing. 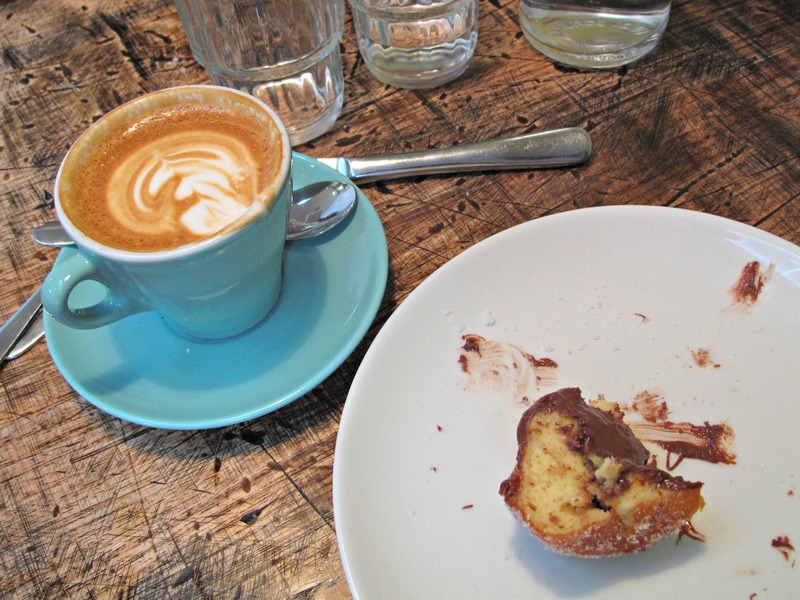 As we’d awaited our meals, Bennie went close to toddlerhood regression and the throwing of a tantrum when he saw the blackboard words “Nutella Donuts” had been crossed out. No problem, my friend – that is yesterday’s news so we’re good to go. Oh boy, this is awesomeness personified – and a bargain at $3.50. 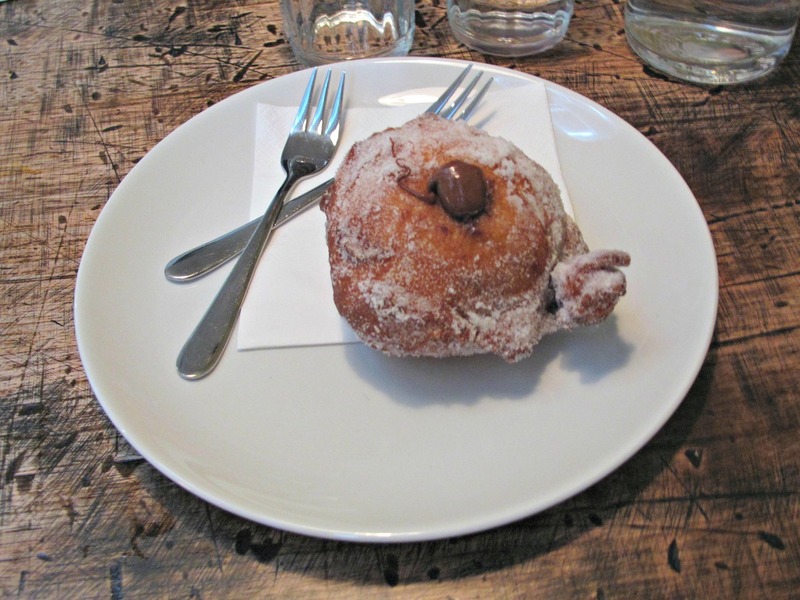 Just so good – ultra gooey and divine. And filling, even shared between the pair of us. Nor surprise, eh, that my $3.60 cafe latte is brilliant? Williamstown locals have a new star to adore. So many great vegetarian options…congrats! And before Plumms there was a fab resto here called Lever & Kowalyk, which was fantastic, ever-reliable, great food, lovely ambience. Hopefully this new place will have the same staying power as the lovely L &K! Hi Anna! Yes! I remember – pre-CTS – going there, too! Was there a set-up after Plumm’s? Yes indeed there was! 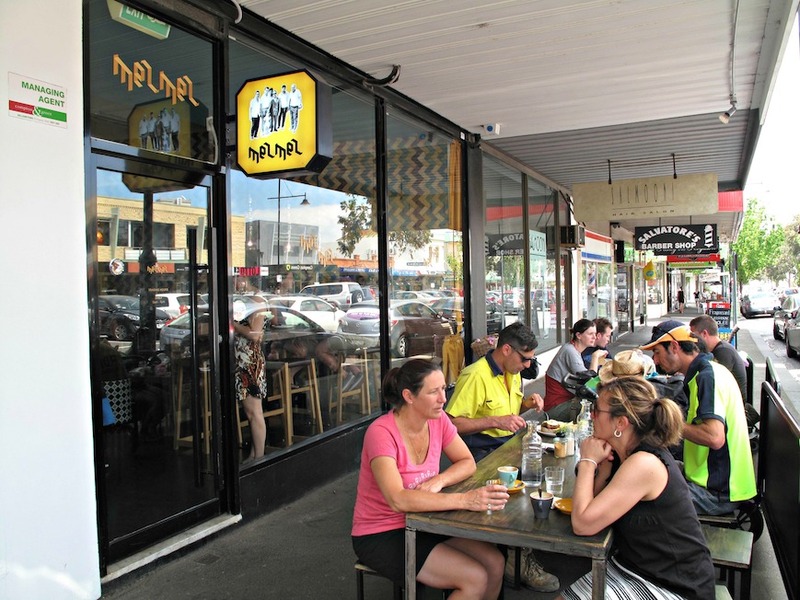 The people from the Corner Shop in Yarraville set up Bruin there which was as great as their Yarraville establishment, but unfortunately despite it seemingly being well -patronised (always full when we visited) it only lasted around 6 months. So sad. I visited MezMez on Friday last and it was as good as you said. I very much enjoyed my spinach gozleme and my companions enjoyed their Mez Platter and the saganaki. And of course the coffee was great too. By the looks of the crowd, the word is out and locals and others are flocking to the joint! That’s great. I’m happy for the CTS readers of Williamstown! We were in Willy on Saturday and dropped in to Mezmez for a late lunch. Very tasty! The falafels were so fresh and herby, they were among the best we’ve ever had. Wish they offered a whole plate of them, not just as part of the platter. Having said that though the other parts of the platter were delicious too. We love it there! You should check out Pizza d’Asporto, too. Things are looking up in Willy!